Michael as Guide of Souls. One of the archangels one of the chief princes"; Dan. x. 13), who is also represented as the tutelary prince of Israel (ib. x. 21, xii. 1). The signification of the name (= "Who islike El"?) was recognized by the Talmudists, who found an allusion to it in Ex. xv. 11 ( ) and in Deut. xxxiii. 26 ( ), combining the first word of the former passage with the second of the latter (Num. R. ii. 9). According to Simeon b. Laḳish, however, the names of the angels were brought by the Jews from Babylon (Yer. R. H. 54d; Gen. R. xlviii. 9). 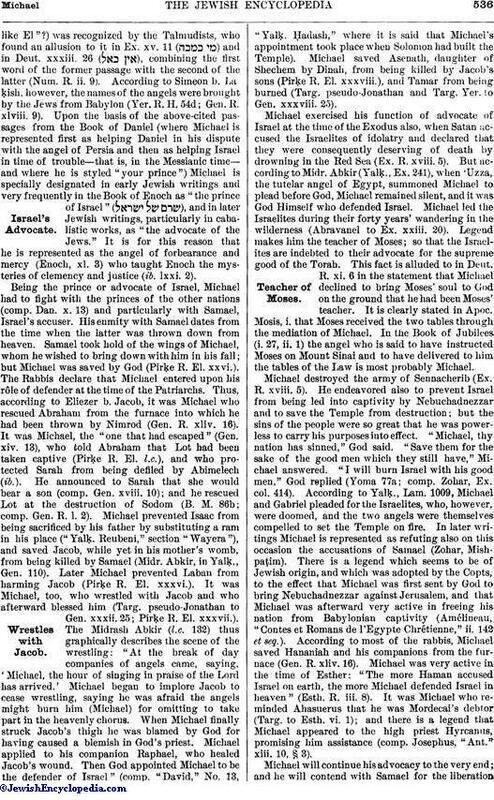 Upon the basis of the above-cited passages from the Book of Daniel (where Michael is represented first as helping Daniel in his dispute with the angel of Persia and then as helping Israel in time of trouble—that is, in the Messianic time—and where he is styled "your prince") Michael is specially designated in early Jewish writings and very frequently in the Book of Enoch as "the prince of Israel" ( ), and in later Jewish writings, particularly in cabalistic works, as "the advocate of the Jews." It is for this reason that he is represented as the angel of forbearance and mercy (Enoch, xl. 3) who taught Enoch the mysteries of clemency and justice (ib. lxxi. 2). Being the prince or advocate of Israel, Michael had to fight with the princes of the other nations (comp. Dan. x. 13) and particularly with Samael, Israel's accuser. His enmity with Samael dates from the time when the latter was thrown down from heaven. Samael took hold of the wings of Michael, whom he wished to bring down with him in his fall; but Michael was saved by God (Pirḳe R. El. xxvi.). The Rabbis declare that Michael entered upon his rôle of defender at the time of the Patriarchs. Thus, according to Eliezer b. Jacob, it was Michael who rescued Abraham from the furnace into which he had been thrown by Nimrod (Gen. R. xliv. 16). It was Michael, the "one that had escaped" (Gen. xiv. 13), who told Abraham that Lot had been taken captive (Pirḳe R. El. l.c. ), and who protected Sarah from being defiled by Abimelech (ib.). He announced to Sarah that she would bear a son (comp. Gen. xviii. 10); and he rescued Lot at the destruction of Sodom (B. M. 86b; comp. Gen. R. l. 2). Michael prevented Isaac from being sacrificed by his father by substituting a ram in his place ("Yalḳ. Reubeni," section "Wayera"), and saved Jacob, while yet in his mother's womb, from being killed by Samael (Midr. Abkir, in Yalḳ., Gen. 110). Later Michael prevented Laban from harming Jacob (Pirḳe R. El. xxxvi.). It was Michael, too, who wrestled with Jacob and who afterward blessed him (Targ. pseudo-Jonathan to Gen. xxxii. 25; Pirḳe R. El. xxxvii.). The Midrash Abkir (l.c. 132) thus graphically describes the scene of the wrestling: "At the break of day companies of angels came, saying, 'Michael, the hour of singing in praise of the Lord has arrived.' Michael began to implore Jacob to cease wrestling, saying he was afraid the angels might burn him (Michael) for omitting to take part in the heavenly chorus. When Michael finally struck Jacob's thigh he was blamed by God for having caused a blemish in God's priest. Michael applied to his companion Raphael, who healed Jacob's wound. Then God appointed Michael to be the defender of Israel" (comp. "David," No. 13, "Yalḳ. Ḥadash," where it is said that Michael's appointment took place when Solomon had built the Temple). Michael saved Asenath, daughter of Shechem by Dinah, from being killed by Jacob's sons (Pirḳe R. El. xxxviii. ), and Tamar from being burned (Targ. pseudo-Jonathan and Targ. Yer. to Gen. xxxviii. 25). Michael exercised his function of advocate of Israel at the time of the Exodus also, when Satan accused the Israelites of idolatry and declared that they were consequently deserving of death by drowning in the Red Sea (Ex. R. xviii. 5). But according to Midr. Abkir (Yalḳ., Ex. 241), when 'Uzza, the tutelar angel of Egypt, summoned Michael to plead before God, Michael remained silent, and it was God Himself who defended Israel. Michael led the Israelites during their forty years' wandering in the wilderness (Abravanel to Ex. xxiii. 20). Legend makes him the teacher of Moses; so that the Israelites are indebted to their advocate for the supreme good of the Torah. This fact is alluded to in Deut. R. xi. 6 in the statement that Michael declined to bring Moses' soul to God on the ground that he had been Moses' teacher. It is clearly stated in Apoc. Mosis, i. that Moses received the two tables through the mediation of Michael. In the Book of Jubilees (i. 27, ii. 1) the angel who is said to have instructed Moses on Mount Sinai and to have delivered to him the tables of the Law is most probably Michael. Michael destroyed the army of Sennacherib (Ex. R. xviii. 5). He endeavored also to prevent Israel from being led into captivity by Nebuchadnezzar and to save the Temple from destruction; but the sins of the people were so great that he was powerless to carry his purposes into effect. "Michael, thy nation has sinned," God said. "Save them for the sake of the good men which they still have," Michael answered. "I will burn Israel with his good men," God replied (Yoma 77a; comp. Zohar, Ex. col. 414). According to Yalḳ., Lam. 1009, Michael and Gabriel pleaded for the Israelites, who, however, were doomed, and the two angels were themselves compelled to set the Temple on fire. In later writings Michael is represented as refuting also on this occasion the accusations of Samael (Zohar, Mishpaṭim). There is a legend which seems to be of Jewish origin, and which was adopted by the Copts, to the effect that Michael was first sent by God to bring Nebuchadnezzar against Jerusalem, and that Michael was afterward very active in freeing his nation from Babylonian captivity (Amélineau, "Contes et Romans de l'Egypte Chrétienne," ii. 142 et seq.). According to most of the rabbis, Michael saved Hananiah and his companions from the furnace (Gen. R. xliv. 16). Michael was very active in the time of Esther: "The more Haman accused Israel on earth, the more Michael defended Israel in heaven" (Esth. R. iii. 8). It was Michael who reminded Ahasuerus that he was Mordecai's debtor (Targ. to Esth. vi. 1); and there is a legend that Michael appeared to the high priest Hyrcanus, promising him assistance (comp. Josephus, "Ant." xiii. 10, § 3). Michael will continue his advocacy to the very end; and he will contend with Samael for the liberationof Israel from Edom or Rome ("Yalḳ. Ḥadash," "Galut," No. 11). Samael will be subdued by Michael; but when the latter asks God to help Israel, God will say, "Israel should turn toward Me, be it only as far as the point of a needle." When Israel turns toward the Lord, his advocate, Michael, will plead in his favor (Pesiḳ. R. 44 [ed. Friedmann, p. 185a]). According to Ex. R. (xviii. 5), Michael and Gabriel will have the charge of vindicating Israel against Edom; but Rabbi's opinion is that Michael alone will act. He will, besides, cleanse Israel from the wicked people ("Otot ha-Mashiaḥ," in Jellinek, "B. H." ii. 61). It was Michael's fight with Samael (with the devil in Assumptio Mosis, x.) which gave rise to the well-known legend of Michael and the dragon. This legend is not found in Jewish sources except in so far as Samael or Satan is called in the Cabala "the primitive serpent" ("naḥash ha-ḳadmoni"). The idea that Michael was the advocate of the Jews became so prevalent that in spite of the rabbinical prohibition against appealing to angels as intermediaries between God and His people, Michael came to occupy a certain place in the Jewish liturgy. Apart from the word , which occurs frequently and which refers to Michael, there are two prayers beseeching him as the prince of mercy to intercede in favor of Israel: one composed by Eliezer ha-Ḳalir (Bartolocci, "Bibl. Rab. Magna," i. 192 et seq. ), and the other by Judah b. Samuel he-Ḥasid (MS. De Cambrai No. 946, fol. 110). But appeal to Michael seems to have been more common in ancient times. Thus Jeremiah is said (Baruch Apoc. Ethiopic, ix. 5) to have addressed a prayer to him. "When a man is in need he must pray directly to God, and neither to Michael nor to Gabriel" (Yer. Ber. ix. 13a). The conception of Michael as an advocate always interceding on behalf of Israel gave rise to another idea, that of his being a high priest making atonement for his people. Ezra recognized the place of the altar by seeing there one on which Michael, the great prince, was in the act of sacrificing (Zeb. 62a; comp. Men. 110a). The fourth heaven is called "Zebul" ( ) because it contains the heavenly Jerusalem, the Temple, and the altar on which Michael, the great prince, sacrifices (Ḥag. 12b). A different statement is given in "Seder Gan 'Eden" (Jellinek, l.c. iii. 137), which places Michael in the upper heaven called "'Arabot" ( ; comp. Midr. Abkir in Yalḳ., Gen. 132). This idea was afterward greatly developed by the cabalists. Michael is identified with Melchizedek ("Yalḳ. Ḥadash," "Mal'akim," No. 19); and the words "and the priest shall pronounce him clean" (Lev. xiii. 23) are explained in the "Tiḳḳune Zohar" (fol. 2b) as referring to Michael, the high priest, acting as the representative of clemency. Michael, the high priest, is the standard-bearer of God (Joseph Gikatilla, "Sha'are Orah," p. 60c). The institution of tithes is ascribed to Michael (Targ. pseudo-Jonathan to Gen. xxxii. 25); and his place is appointed in the east, with the tribe of Levi ("Midr. Konen," in Jellinek, l.c. ii. 39). With regard to the nature of the offerings which Michael brings to the altar, one opinion is that they are the souls of the just, while according to another they are fiery sheep (Tos. to Men. 110a). The former opinion, which has become prevalent in cabalistic writings ("Seder Gan 'Eden," l.c. ; "Yalḳ. Ḥadash," "Neshamot," No. 31; "Reshit Ḥokmah," ch. iii. ), explains the important position occupied by Michael in Jewish eschatology. The idea that Michael is the Charon of individual souls, which is common among Christians, is not found in Jewish sources, but that he is in charge of the souls of the just appears in many Jewish writings. In the Testament of Abraham (Robinson, "Texts and Studies," ii. 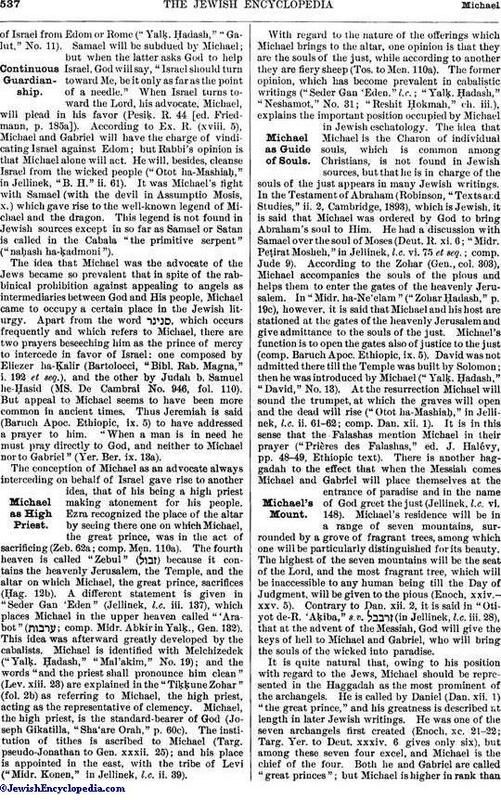 2, Cambridge, 1893), which is Jewish, it is said that Michael was ordered by God to bring Abraham's soul to Him. He had a discussion with Samael over the soul of Moses (Deut. R. xi. 6; "Midr. Peṭirat Mosheh," in Jellinek, l.c. vi. 75 et seq. ; comp. Jude 9). According to the Zohar (Gen., col. 303), Michael accompanies the souls of the pious and helps them to enter the gates of the heavenly Jerusalem. In "Midr. ha-Ne'elam" ("Zohar Ḥadash," p. 19c), however, it is said that Michael and his host are stationed at the gates of the heavenly Jerusalem and give admittance to the souls of the just. Michael's function is to open the gates also of justice to the just (comp. Baruch Apoc. Ethiopic, ix. 5). David was not admitted there till the Temple was built by Solomon; then he was introduced by Michael ("Yalḳ. Ḥadash," "David," No. 13). At the resurrection Michael will sound the trumpet, at which the graves will open and the dead will rise ("Otot ha-Mashiaḥ," in Jellinek, l.c. ii. 61-62; comp. Dan. xii. 1). It is in this sense that the Falashas mention Michael in their prayer ("Prières des Falashas," ed. J. Halévy, pp. 48-49, Ethiopic text). There is another haggadah to the effect that when the Messiah comes Michael and Gabriel will place themselves at the entrance of paradise and in the name of God greet the just (Jellinek, l.c. vi. 148). Michael's residence will be in a range of seven mountains, surrounded by a grove of fragrant trees, among which one will be particularly distinguished for its beauty. The highest of the seven mountains will be the seat of the Lord, and the most fragrant tree, which will be inaccessible to any human being till the Day of Judgment, will be given to the pious (Enoch, xxiv.-xxv. 5). Contrary to Dan. xii. 2, it is said in "Otiyot de-R. 'Aḳiba," s.v. (in Jellinek, l.c. iii. 28), that at the advent of the Messiah, God will give the keys of hell to Michael and Gabriel, who will bring the souls of the wicked into paradise. It is quite natural that, owing to his position with regard to the Jews, Michael should be represented in the Haggadah as the most prominent of the archangels. He is called by Daniel (Dan. xii. 1) "the great prince," and his greatness is described at length in later Jewish writings. He was one of the seven archangels first created (Enoch, xc. 21-22; Targ. Yer. to Deut. xxxiv. 6 gives only six), but among these seven four excel, and Michael is the chief of the four. Both he and Gabriel are called "great princes"; but Michael is higher in rank thanGabriel (Ber. 4b; Yoma 37a). He is the viceroy of God, who rules over the world (Enoch, lxix. 14 et seq. ), and wherever Michael appears the Shekinah also is to be found (Ex. R. ii. 8). Michael is on the right of God's throne, while Gabriel is on the left ("Haggadat Shema' Yisrael," in Jellinek, l.c. v. 166; Targ. to Job xxv. 2; Enoch, xl. 9). Four armies of angels sing in praise of the Lord, the first being that of Michael at the right hand of God (Pirḳe R. El. iv. ; "Hekalot," in Jellinek, l.c. ii. 43-44). A similar tradition is given in "Seder Gan 'Eden" (l.c. p. 138): Michael's place is by the first river, Pison, while Gabriel's is by the second, Gihon. It is Michael who, on account of his occupying the first place near God, receives the prayers of men from the angels and presents them to God (Baruch Apoc. Slavonic, xii.). His position makes him the companion of Meṭaṭron (Zohar, i. 149b). As an angel of nature, Michael is represented as of the element of water, on account of which he is the prince of water, while Gabriel is the prince of fire ("'Ammudeha Shib'ah," p. 49c; "Berit Menuḥah," 37a; and elsewhere). This is probably the origin of the haggadah that when Solomon married Pharaoh's daughter, Michael drove into the bed of the sea a stick around which slime gathered and on which, later, Rome was built (Cant. R. i. 6). In Sanh. 21b and Shab. 56b, however, this is ascribed to Gabriel, owing to a confusion which occurs also in Targ. to Job xxv. 2, where Michael is called the prince of fire. Michael is really the prince of snow, which is the element of water (Deut. R. v. 12); and he is also the angel of silver, while Gabriel is the angel of gold ("Yalḳ. Ḥadash," "Mal'akim," No. 75). Michael presides over the planet Mercury and consequently over Wednesday (Abraham Avenar, in Münster, "Calendar Hebræorum," Basel, 1527). The same statement is given in the Hebrew manuscripts Paris No. 602 (fol. 142a) and No. 603 (fol. 125a), both containing cabalistic formulas. But it would more befit Michael to preside over Saturn and be the angel of Saturday; and this position is ascribed to him in "Sefer Razi'el," pp. 8a, 17b. He presides over the second solar period ("teḳufah") and over the south wind, which blows during that season (ib. 7a; Paris MS. No. 602, fol. 122a). He is the third of the "figure equivalents" ("Ḳeneh Binah," p. 19a); and in enchantment his name is pronounced to charm reptiles ("Sefer Razi'el," p. 4a). See Angelology. M. Schwab, Vocabulaire de l'Angélologie, s.v. , Paris, 1897. Michael is called in Arabic literature "Mika'il" or (in the Koran) "Mikal." He is one of the four archangels, and, according to Arabic tradition, he occupies a similar position among the Jews to that occupied by Gabriel among the Arabs; that is to say, he is their peculiar guardian. In the Koran Michael is mentioned once only, in sura ii. 92. In his commentary on verse 91 of that sura, Baiḍawi relates that on one occasion Omar went into a Jewish school and inquired concerning Gabriel. The pupils said he was their enemy, but that Michael was a good angel, bringing peace and plenty. In answer to Omar's question as to the respective positions of Michael and Gabriel in God's presence, they said that Gabriel was on His right hand and Michael on His left. Omar exclaimed at their untruthfulness, and declared that whoever was an enemy to God and His angels, to him God would be an enemy. Upon returning to Mohammed, Omar found that Gabriel had forestalled him by revealing the same message, which is contained in verse 92. The commentators state with reference to sura xi. 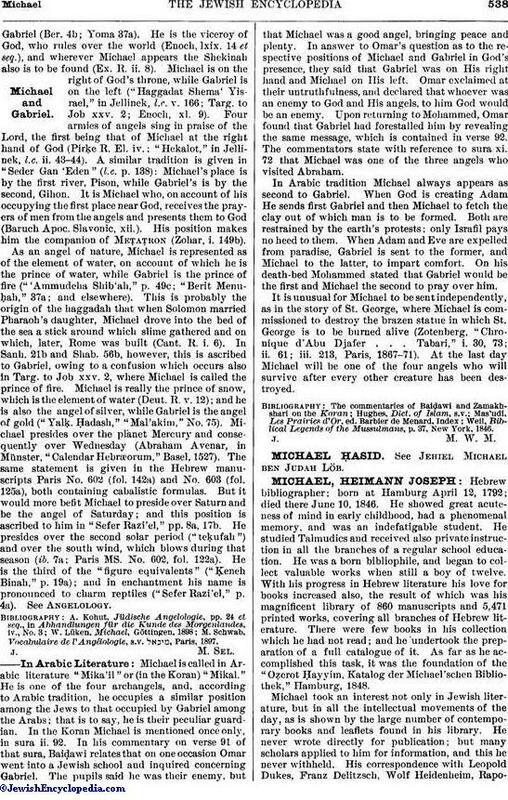 72 that Michael was one of the three angels who visited Abraham. In Arabic tradition Michael always appears as second to Gabriel. When God is creating Adam He sends first Gabriel and then Michael to fetch the clay out of which man is to be formed. Both are restrained by the earth's protests; only Israfil pays no heed to them. When Adam and Eve are expelled from paradise, Gabriel is sent to the former, and Michael to the latter, to impart comfort. On his death-bed Mohammed stated that Gabriel would be the first and Michael the second to pray over him. It is unusual for Michael to be sent independently, as in the story of St. George, where Michael is commissioned to destroy the brazen statue in which St. George is to be burned alive (Zotenberg, "Chronique d'Abu Djafer . . . Tabari," i. 30, 73; ii. 61; iii. 213, Paris, 1867-71). At the last day Michael will be one of the four angels who will survive after every other creature has been destroyed. 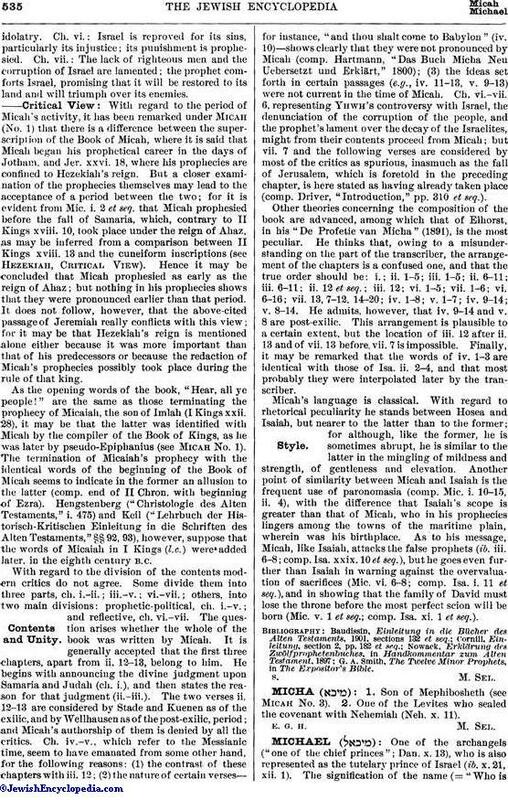 Weil, Biblical Legends of the Mussulmans, p. 37, New York, 1846.